A final spin of the bike before racking and either I’m even slower than I fear, or as usual everyone is hammering up the climb out of Puerto Calero. I had two objectives – stay aero and hold race pace on the climb. The first was easy, the second harder as my Powertap batteries had chosen this inopportune moment to die forcing me back to heart rate. It was comfortable without being easy, yet groups of riders pulled away; it felt like race day. Every time I’ve raced here – even with the saddle sore – athletes speed past me on this climb only for me to overtake them miles before the finish. I assume they can’t have made a plan. Every race needs a plan, even more so when you aren’t as fully prepared as normal. Tomorrow is about efficiency, completing the race in as cost effective way as possible, because after it comes a 70.3, then another Ironman, and so on. It’s a busy season. So I need a plan that sits in the context of broader goals and my limited preparation – one that will see me recovering rapidly after the race, but won’t leave me on the course for too long. The keyword will be moderation and effort will be firmly capped. If there is one advantage to lower swim fitness it’s feeling no temptation to get involved in the front of pack swim; I’ve witnessed it from both sides, it’s messy. This time I’m placing myself further back with a 1:10 swim in mind. I can line up midfield, standing to the right to allow me into the open water away from the buoy line. Then as the course turns left and the swimmers thin out I can move back in relatively unimpeded. It’s not a plan that allows me much benefit from drafting, but it keeps me relaxed. Pacing is key to avoiding the detonation of Challenge Henley’s swim; setting my goal 10 minutes slower than previous years should allow me to cover the 3.8km in relative comfort. The Blue Triad is here for training not racing, with – frustratingly non-functional – Powertap and Open Pro rims, rather than the full aero setup. Power would have allowed precise pacing control, in its absence heart rate will have to substitute. As with the swim I’m scaling back my goals. I attempted – and failed – to hold 250W at the Outlaw last year; here I wanted to average around 210W only reaching towards 250W on the climbs, but with power unavailable I will aim for a heart rate in the 130s, peaking into mid-140s in the hills. A solid effort over six hours, but not too much of a stretch. I’m willing to adjust this strategy based on feel – a conservative bike that leaves me capable of running is needed. Fuelled by the memory of an exceptionally slow Lanzarote marathon I am determined to pace the run correctly. I’ll adopt a similar strategy to Challenge Henley – using my Garmin to limit my pace, particularly during the first loop. Beyond that I’ll see how I feel, I won’t commit to anything faster than 5 minute kilometres until after the half-marathon, then – perhaps – I’ll open things up. I’d rather see a consistently paced, but steady completion of the marathon, than walk the final 10km. But the run is where I hold some ambition – I would like nothing more than to better last year’s run times. Every other detail – the nutrition, the equipment choices – I’m keeping simple and low key. A bottle of gels on the bike as my main energy source, if I need more I’ll take it from aid stations; coke, energy drink and water on the run should keep me moving. 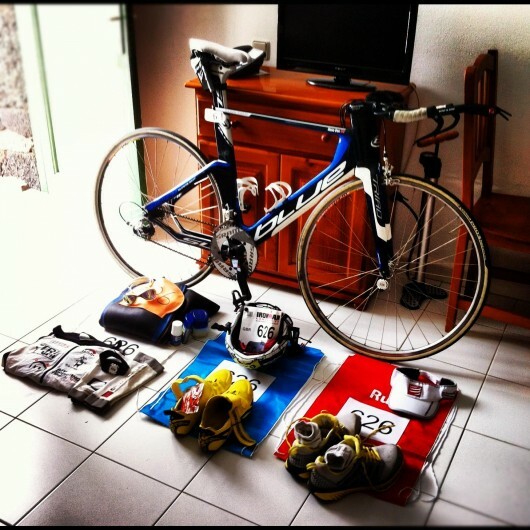 Heavy training wheels, vented road helmet, ordinarily laced run shoes – my kit says I’m here to train not race. Ultimately the goal is to build a better picture of current fitness and performance capabilities and hopefully to improve my motivation. Lanzarote has often been the kick I needed to get me back to full fitness. Time and placing don’t matter. But for some reason I’m still nervous.